NEED A LAWYER? YOU MAY QUALIFY FOR HELP. To learn more about cases we handle or becoming a client, visit our Cases and Clients tabs. Our pro bono project, Put Something Back, provides the pipeline to pro bono opportunities for all attorneys, including corporate, government sector, public interest, emeritus, law firms, voluntary bar associations, law schools and others seeking to give back to the most needy members of society. In 2018, Renew your Individual Attorney and Law Firm Commitment HERE. Accept at least one new pro bono case by visiting our Volunteer and Register tabs. We gratefully acknowledge The Florida Bar Foundation and Dade County Bar Association for Funding Disaster Relief Efforts for those who have been affected by the hurricanes. Dade Legal Aid provides a critical safety net of comprehensive civil legal services for low income residents with problems related to family law matters, domestic violence injunctions, housing, discrimination, benefits, guardianship, unfair sales, contractor fraud, disaster relief, insurance claims and other areas of law. 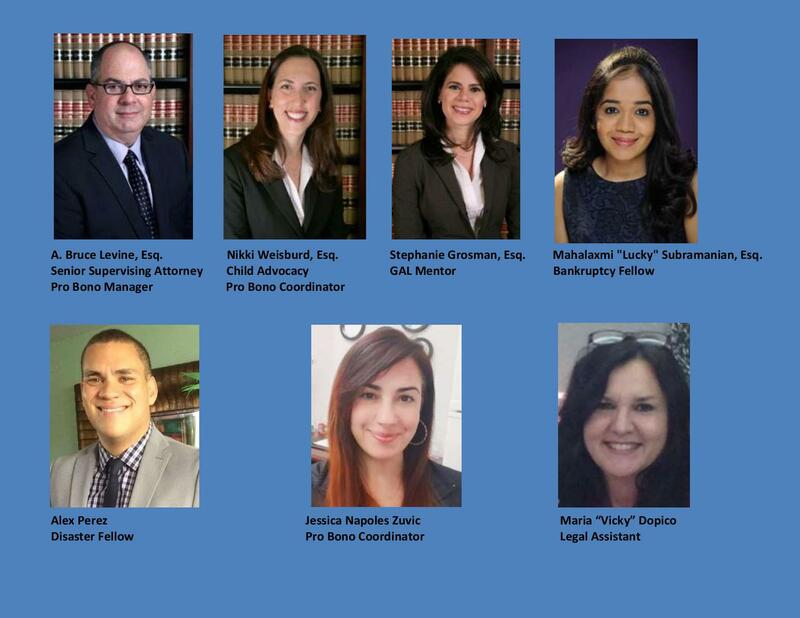 Our pro bono department, Put Something Back, a Joint Pro Bono Project of the Courts and Dade Legal Aid, connects those in need with dedicated volunteers and disaster recovery networks. Many thanks to The Florida Bar Foundation, The Statewide Guardian ad Litem Program, The Miami Foundation, The American College of Bankruptcy Foundation, The Dade County Bar Association, The Bankruptcy Bar Association and hundreds of 100% Law Firm Participants, among others for supporting critical legal services to the most disadvantaged residents of our community with nowhere else to turn to for help.